The Cornish–Windsor Covered Bridge is a one hundred and fifty-two-year-old, two-span, timber King-truss, interstate, covered bridge that crosses the Connecticut River between Cornish, New Hampshire (on the east), and Windsor, Vermont (on the west). Until 2008, when the Smolen–Gulf Bridge opened in Ohio, it had been the longest covered bridge (still standing) in the United States. There were three bridges previously built on this site—one each in 1796, 1824 and 1828. The 1824 and 1828 spans were constructed and operated by a group of businessmen which included Allen Wardner (1786–1877). The current bridge was built in 1866 by Bela Jenks Fletcher (1811–1877) of Claremont and James Frederick Tasker (1826–1903) of Cornish at a cost of $9,000 (equivalent to $154,002 in 2018). The bridge is approximately 449 feet (137 m) long and 24 feet (7 m) wide. The structure uses a lattice truss patented in 1820 and 1835 by Ithiel Town (1784–1844). From 1866 through 1943, it operated as a toll bridge. According to a 1966 report by the New Hampshire Division of Economic Development, the bridge was plenty long enough to earn the name "kissin' bridge", a vernacular of covered bridges referring to the brief moment of relative privacy while crossing. Other tolls, in 1866, ran as high as 20 cents (equivalent to $3 in 2018) for a four-horse carriage. The span was purchased by the state of New Hampshire in 1936 and became toll-free in 1943. 1970: The American Society of Civil Engineers (ASCE) designated the bridge a National Civil Engineering Landmark. 1976: The bridge was listed in the National Register of Historic Places. 1988: The Cornish-Windsor Covered Bridge was rehabilitated, funded by the Federal Highway Administration. While the Old Blenheim Bridge had and Bridgeport Covered Bridge has longer clear spans, and the Smolen–Gulf Bridge is longer overall, with a longest single span of 204 feet (62 m), the Cornish–Windsor Bridge is still the longest wooden covered bridge and has the longest single covered span to carry automobile traffic. (Blenheim was and Bridgeport is pedestrian only.) The Hartland Bridge in Hartland, New Brunswick, Canada, is longer than the Cornish-Windsor Bridge, and is currently open, but the claim that Cornish-Windsor was the longest was made when the Hartland was closed. Vermont Route 44 in Windsor heading southeast, ends at Main Street. (Main Street is also US 5 and VT 12.) Continuing past Main, the road becomes Bridge Street. Traveling on Bridge Street from Main, the Windsor bridge approach is about 2 tenths of a mile or 350 yards (320 m). After crossing the bridge, Bridge Street ends at New Hampshire Route 12A, which runs along the Connecticut River on the west and Cornish Wildlife Management Area on the east. 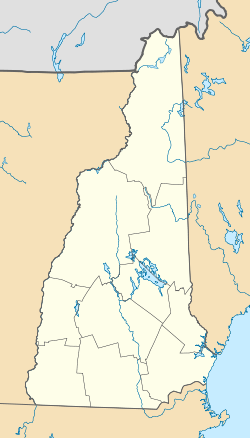 Although the public sometimes perceives the bridge as being solely in Windsor, the bridge is mostly in Cornish, given that the New Hampshire-Vermont boundary runs along the western mean low-water mark of the Connecticut River. Put another way, when one enters the bridge from the Windsor side, one is immediately in New Hampshire. On New Hampshire Route 12A (Town House Road) in Cornish, coming from the south, Bridge Road is a T intersection on the left (west). Traveling from the north, from West Lebanon, New Hampshire, New Hampshire Route 12A is a notably scenic route along the Connecticut River. Historical marker Traveling from Cornish, just before the bridge intersection (about 100 ft. south of the bridge intersection), on the left, there is a parking area (about 175 ft. x 27 ft.) for viewing the bridge with a historical marker. The marker (NH Historical Highway Marker No. 158) is one of four in Cornish. Viewed from the Cornish side. The lattices are the diagonal beams on the sides attached to the chords (horizontal beams running, lengthwise, parallel to the floor planks); from top to bottom – the primary upper chord, the secondary upper chord, the secondary lower chord, and the primary lower chord. Underside showing – from the bottom up – the lower lateral braces attached to the floor joists that support the floor planks. Looking south and downstream, the four (of five) bridge piers seen in the background are those of the New England Central Railroad Connecticut River Bridge No 3, served locally by Amtrak's Vermonter stop at the Windsor Station. The sightline of the roadroad bridge is eclipsed by the Cornish-Windsor Bridge. ^ Horton, John (2008-08-23). "Ashtabula County really has it covered; New roofed span snatches title of nation's longest". The Plain Dealer. Retrieved 2008-08-28. ^ Vermont v. New Hampshire 289 U.S. 593 (1933) says the river, and therefore the bridge, is all in New Hampshire.